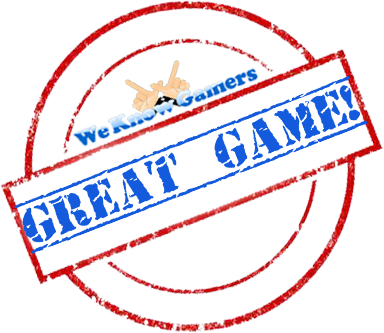 A charming, rogue like game that challenges you on every play through! 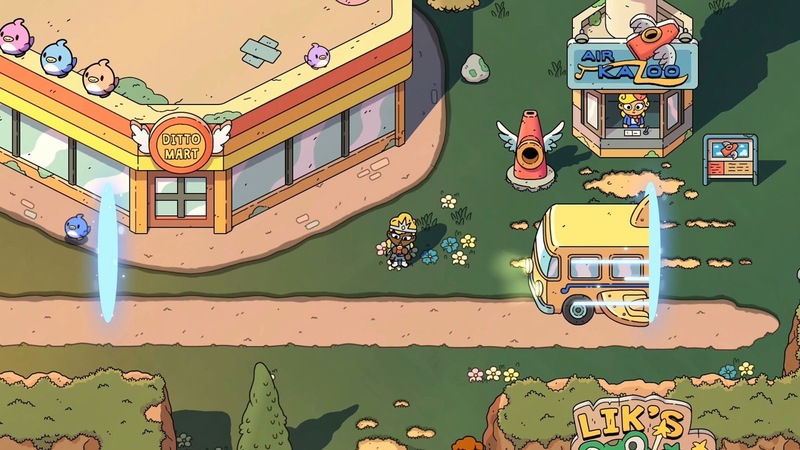 The Swords of Ditto will test your grit, but is it still a fun game? The Swords of Ditto begins with the legendary hero taking on the evil sorcerer Mormo and eventually dying (like super easily). This causes the land to be covered in darkness for 100 years until one day, a new hero rises to vanquish the evil. Now what makes this different to most hero adventures is that during the 100 years, things can change so drastically due to the rogue-like nature of the game which in turn can cause you to die again and again... oh and again. This is something you should get used to initially. but things do pick up later. I'm not sure how many heroes I've gone through so far, but every time you do comeback and find the body of the previous hero, you gain their skills, equipment and power, something I was glad to see. Levelling up is quite important. Not only to better defend yourself against enemies, but also dungeons are only unlock able once you reach a certain point. Luckily instead of running around aimlessly, there are a few areas where you can run a gauntlet of sorts over multiple levels. This is perfect for those looking to power up, but again may not really be feasible seeing as you have a limited amount of time. In regards to time, you have 4 in game days before you have to fight the final boss. Now I've tried this and while there's someone out there who probably got through it, the amount of enemies you're presented with makes things incredibly difficult. Thankfully there is a time altering mechanic that can give you two days at a time. I unfortunately wasn't able to get this until a few deaths later, but once you do have it, things become a little lighter. One classic this game really seems to borrow from is The Legend of Zelda series or to be more specific, its old school top-down roots. From the hack and slash combat to the dungeon layouts, it has been heavily inspired from those games and with the addition of the changing world, it can keep things pretty fresh on every play through. The game does also include towns and interesting characters to speak with that have their own experience when it comes to the darkness taking over the land during the 100 years there was no hero available. There are also shops where you can buy stickers which can be equipped to your character for that extra stat boost and toys for your weapons. You can also get consumables for aspects like health and poisoning, but these can also be found out in the world too. 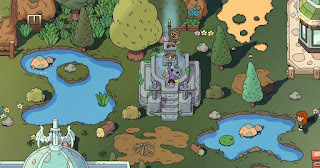 For me the biggest thing that stood out would have to be the visual style that is very reminiscent to me of Adventure time. Big, bright colours and being just downright weird. Its been put together in a way that's meant to put a big smile on your face even with such high stakes. 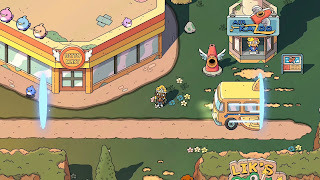 Alone I found The Swords of Ditto an OK experience, however I believe the game really shines with the addition of co-op and for me personally, having another player there to help with the enemies and dungeon bosses was a much welcome addition. While I love the fact that more developers are embracing couch co-op it was a shame to see that there was no option to team up with your friends online. Hopefully this is something that can be patched in one day. 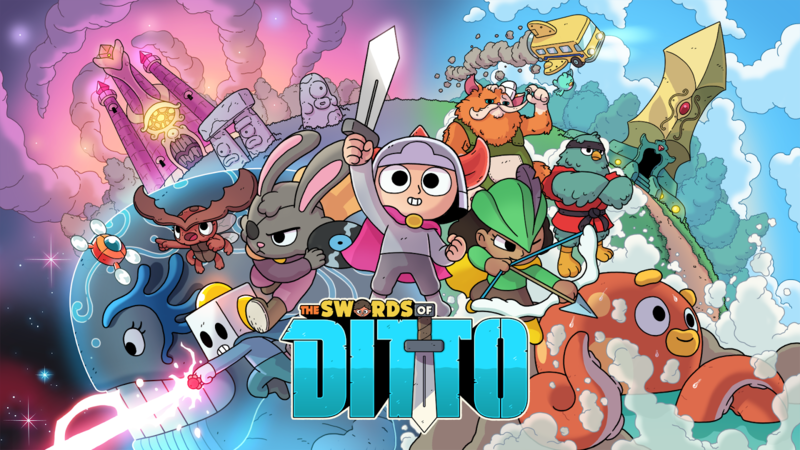 The Swords of Ditto has been an enjoyable experience overall and when it comes down to it, is still a good game. I still think its odd that you always have to hit a new level when resurrected and there is no online co op available here, however the idea of going against time and making me feel like I'm playing an old school Zelda is a huge plus.